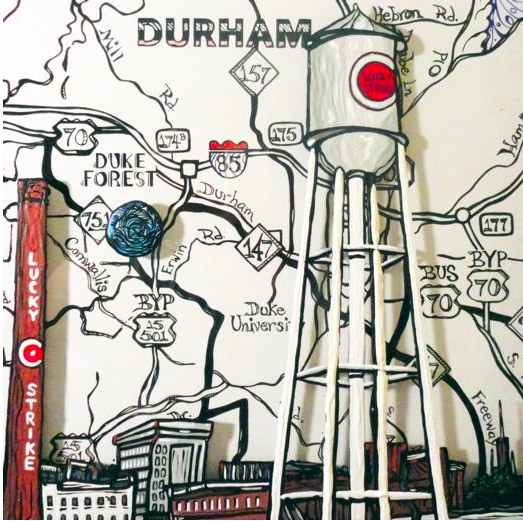 We recently got together to talk with Aaron Mandel, founder of Clarion Content*, about the Durham Under Development project that he's been curating in collaboration with Pleiades Gallery, The Durham Hotel, 21c, and various community members and artists. Aaron believes in collaboration and conversation; he insists that the only way for Durham to grow and develop in a sustainable way that serves its existing and future community members is to collaborate with developers who, as he's found, really do want to work with Durham's community. Developers are ready to listen. Now, it's up to us to join the conversation. Stop by one of the upcoming events to learn about the project, meet like-minded folks, hear some interesting perspectives, contribute your own unique thoughts, and view some striking art! The first event of the series is tomorrow, so mark your calendars and come on out! *"Clarion Content is a Durham, N.C. based online media outlet focusing on the art, music, food, politics, fashion, and culture that keep our streets moving. Our aim is to provide quality feature, review, fiction, news, and style content to keep your lives entertained and always driving forward. We work with local galleries, boutiques, restaurants, night life spots, public figures, and musicians to bring mediums together in a way not seen before, co-promoting and supporting each other while creating new content daily for our blog."